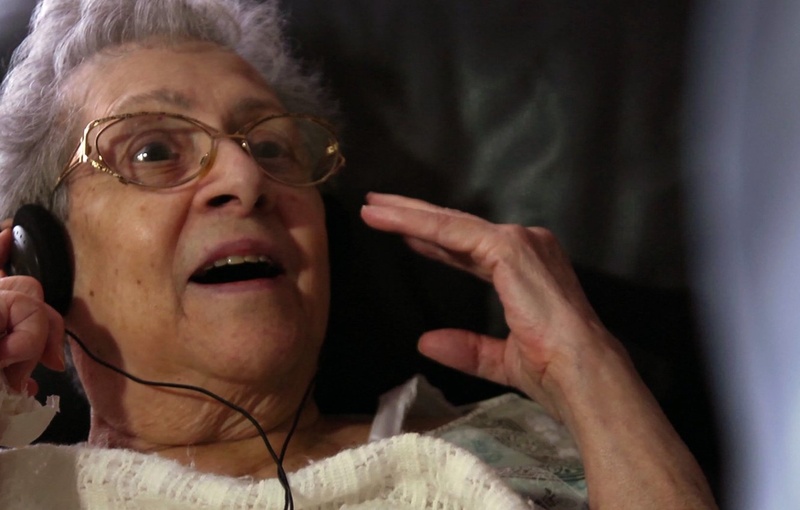 “Alive Inside” shows how dementia patients are transformed by hearing their favorite music. Think of them as Lazarus moments. One by one, we are introduced to a series of elderly people with serious dementia. People who’ve barely said a word in years, who don’t recognize their own children, who sit around nursing homes like the living dead. Then Dan Cohen does something to them and it’s like a switch has been turned on. They become, all of a sudden, gloriously happy and alive. As detailed in the joyous, unexpectedly uplifting “Alive Inside,” winner of Sundance’s coveted audience award for U.S. documentary, what Cohen has done is place iPod earphones on these people’s heads and played what family members have told him is their favorite music. The effect is miraculous. There’s Alice, who so lights up on hearing “When the Saints Go Marching In” that she says in amazement, “I didn’t know I could talk so much.” There is all-but-comatose John, whose feet start to move in long-forgotten dance movements. And there is Henry, who goes from catatonic to effusive, speaking not just sentences but entire paragraphs, telling the world, “I’m crazy about music. Cab Calloway is my No. 1 guy,” before going into a perfect imitation of Calloway’s patter. In a world drowning in bad news about dementia – an estimated 5 million Americans currently suffer, 10 million serve as their caregivers, with both numbers inevitably going up – “Alive Inside” is positively tonic. Though it has points to make about things like the nature of nursing homes and the direction of medical treatment, its raison d’etre is to show us the power of music to reach and delight the previously unreachable. In fact, “Alive Inside” began when Cohen, who’d been a social worker before founding Music & Memory to help bring individualized music to nursing homes, invited filmmaker Michael Rossato-Bennett to accompany him on a nursing home visit. That day led to more than a year of filming and the current feature. Though it’s partially the way music gets wired into our brains that makes it so effective, there are other, psychological factors as well. The nursing home experience, we are reminded, is one in which residents lose choice in and control over their lives. As one expert says, “They lose independence, dignity, their loved ones.” Music, on the other hand, creates spontaneity, giving the listeners the chance to go off into a world of their own creation. As much a plea to change the system as it is an examination of how music helps individuals, “Alive Inside” is not the most sophisticated documentary, but its power is indisputable, and it does end on a hopeful note. After the scene of Henry waking up appeared on Reddit, it was downloaded more than 7 million times, and there is considerable anecdotal evidence that some of those people tried playing music for dementia patients they were personally connected to. There are also indications that exposure to music helps individuals avoid institutionalization and remain with their families. Maybe people can be raised from the almost dead, even if it has to be done one person at a time.